Together with Johann Adolf Hasse, Carl Heinrich Graun was the chief representative of Italian Opera in Germany in the 18th century. The story of „Montezuma“ accords with the historical fate of the last ruler of the Aztecs. The text is by King Frederick II, Graun had a close friendship to him and became chief of the circle of Berlin composers. „Montezuma“ can be seen as Frederick’s countersignature to his own fate, which made him into a martial war-prince. „Montezuma“ shows him in a field of tension: thus the artistically-minded idealistic prince became the royal practical politician: if justice is to be seen to be done to life’s reality, Montezuma must die. 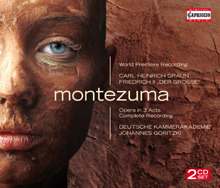 Montezuma is mor than just a Baroque opera. This opera can allude to the history of its own nation. It directs our ear to the destiny of America and the destiny of Prussia, to the German’s view, 200 years ago, of America, and American history as the mirror of its own.